The art of bird-watching is one prized by many millions across the globe. However, in order to see the most spectacular species of birds, you will have to do a lot of traveling! Here is a summary of 15 of the most beautiful and rare species of birds that, unfortunately, are nearing extinction. Take the ultimate bird watching tour right from your seat! A bird almost too beautiful to believe, these colorful creatures reside in the Andes Mountains of South America. They nest among the rocks in order to hide their extraordinary appearance that attracts preying eagles and jaguars. These birds have a wonderful pompom-shaped crests atop their beaks which are used during the mating season to attract and impress females. 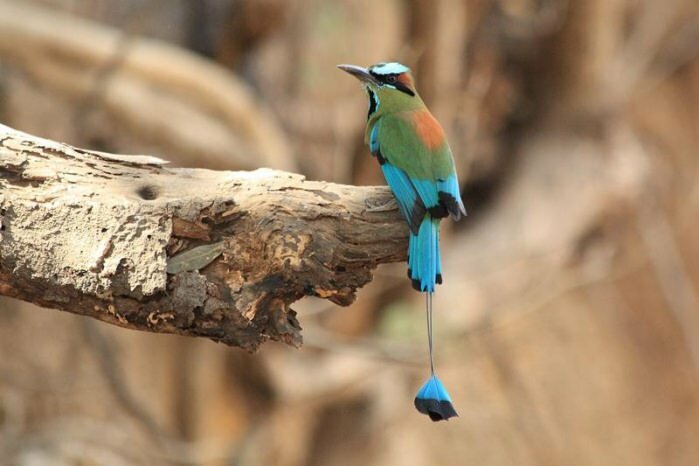 Another bird full of stunning colors, the Turquoise-Browed Motmot can be found in the tropical areas of South America, although the origins of the bird trace back to Switzerland. They live in the thick rain forests where they try to blend in with their bright colors to hide from prey. Its plumage is extremely soft and it has a tail that can move in any direction. The kakapo or the owl parrot is one of the strangest and rarest nocturnal parrots in the world. The bird also does not fly, but happens to be one of the longest-living birds. These parrots are also very heavy and large, reaching a weight of about 7.7 pounds and a height of nearly about 24 inches. 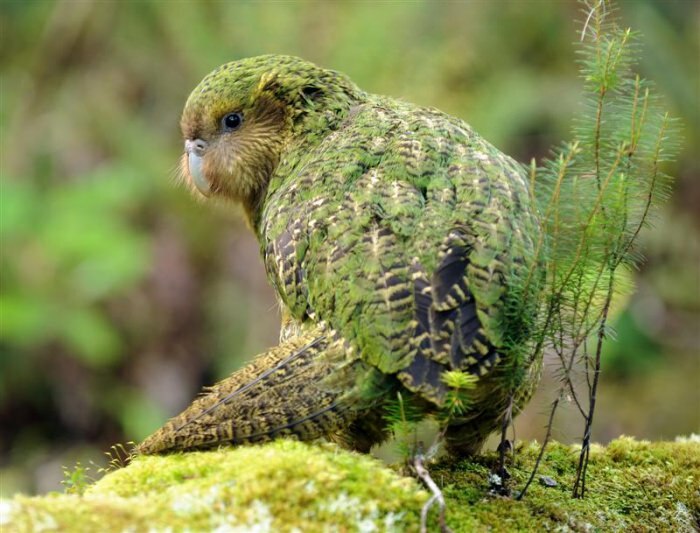 Kakapos are common in New Zealand, and they are known to be extremely smart animals, getting attached to people who are kind to it. Unfortunately, the Kakapo is nearly extinction and is considered ‘critically endangered’ by many bird specialists. 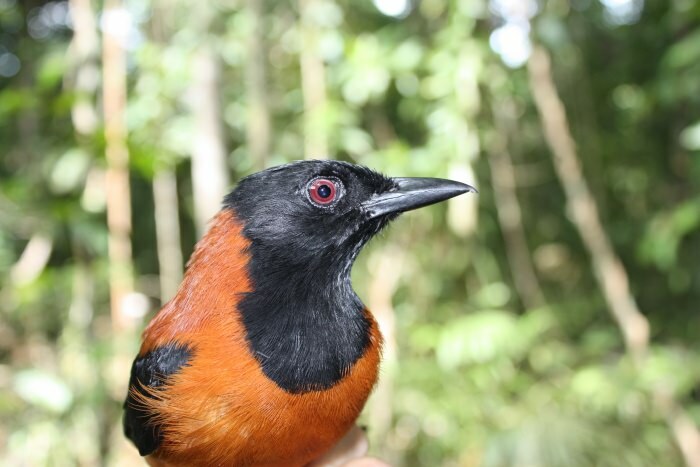 The Hooded Pitohui is the famous songbird of New Guinea with bright black and orange plumage. 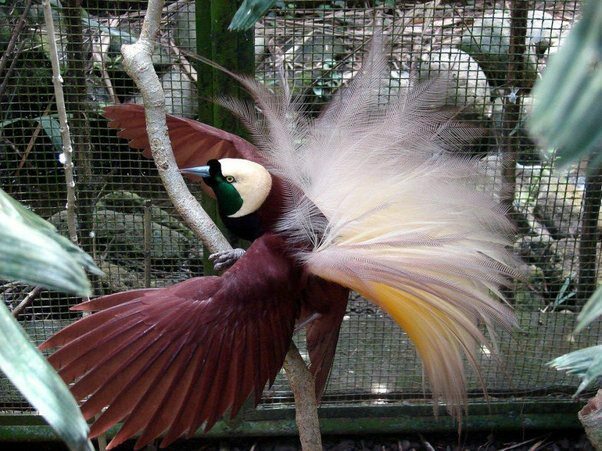 It is considered to be the only poisonous bird in the world with feathers that burn at human touch. The bird is poisonous because it eats Melyrid beetles, which are themselves poisonous. 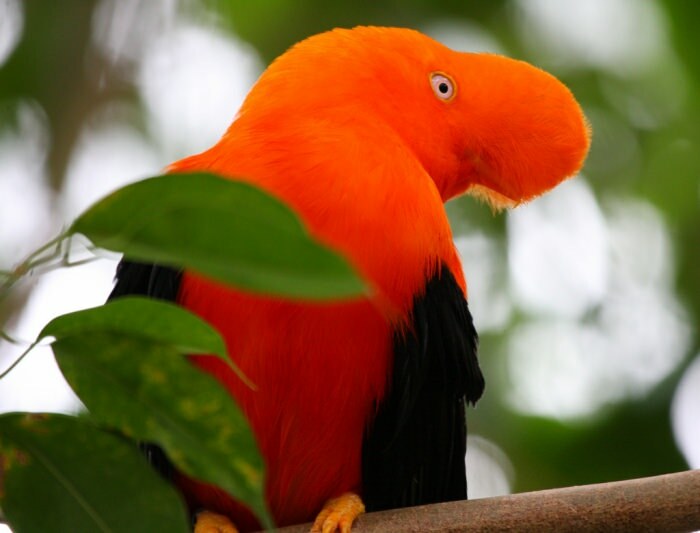 Their bright plumage is meant to warn other birds and species not to eat them! The Quetzal are shockingly colored birds common to western Mexico and Guatemala. 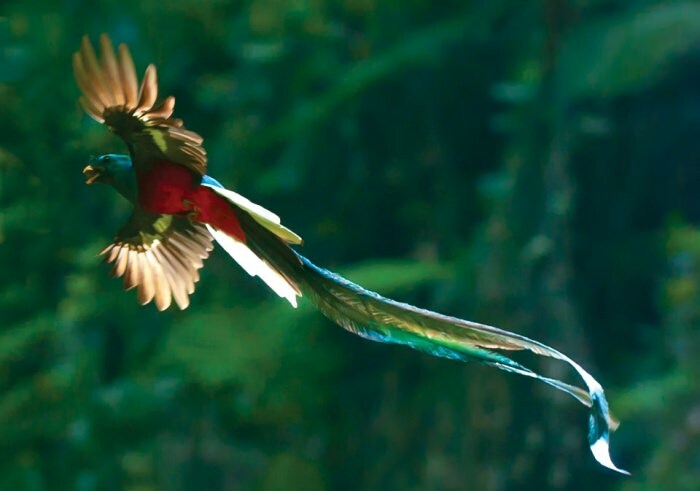 Historically, they were sacred to the Mayan and Aztec people, who believed that the Quetzal was the God of Air and used their green tail feathers in spiritual ceremonies. The bird inhabits the cold mountain woods, and during the dry seasons, it perches at a height of nearly 10,000 feet! The Great Curassow is a large, pheasant- bird that resides in the rainforests of Mexico and Central America. This bird can reach an astounding length of 39 inches and can weigh over 15 pounds! 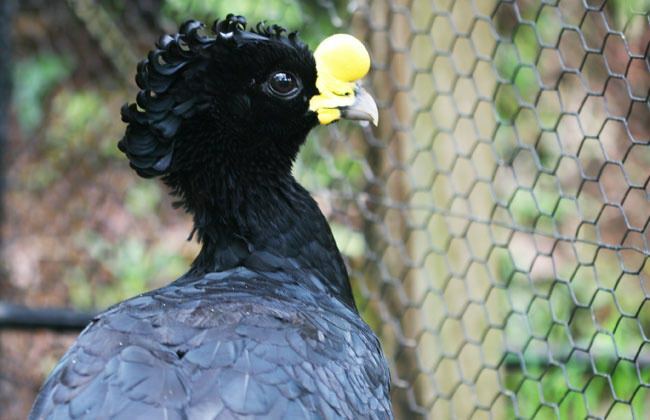 The Great Curassow spends most of its time in tree tops and nests at altitudes of up to 98 feet. The bird is very sensitive to human presence and will leave the area at the slightest indication of people. 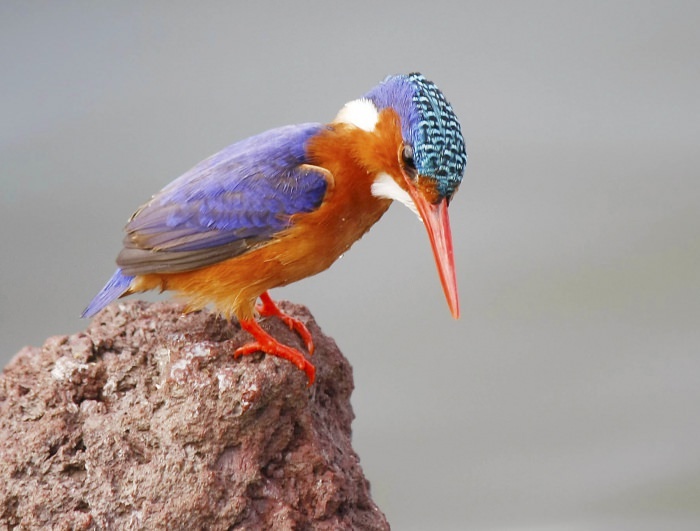 This river kingfisher is distributed in Africa throughout the southern Sahara. They have excellent binocular eyesight and can distinguish between colors, which is rare in all species of bird. The kingfisher feeds by diving into the water to catch small fish and worms and it can estimate the depths of water very accurately. While underwater, the bird’s eyes are covered with special protective skin that allow it to see. This very large and presuming bird is common in the Malay peninsula, in the areas of Sumatra and Borneo between Malaysia and Indonesia. They are the largest of the ‘rhino’ birds in Asia, with beaks made of pure bone that constitute up top 10 percent of their weight. 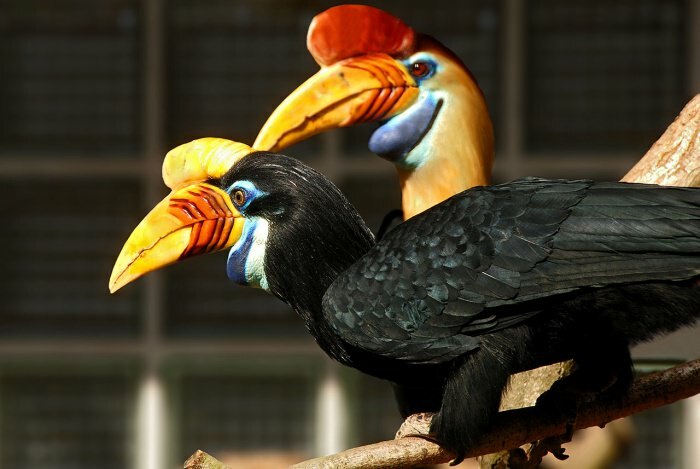 The helmet on their beaks are unfortunately collected as material for handicrafts, despite the fact that they are considered ‘near threatened’ by most major nature authorities. They have a very unusual birdsong that resembles musical laughter. 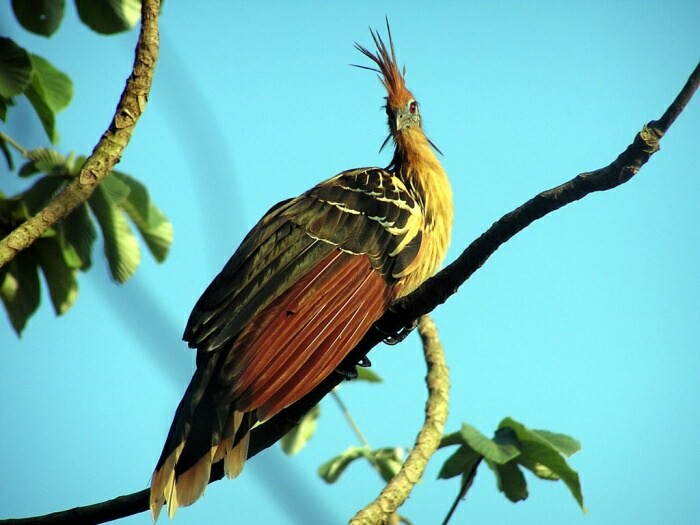 The Hoatzin is another pheasant-sized bird found in the swamps, mangroves and forests of the Amazon in South America. They are also known as ‘stinkbirds’ because they spend most of their time lounging on branches digesting their food. These birds have two claws on each of their wings, which they use for climbing trees and catching prey. 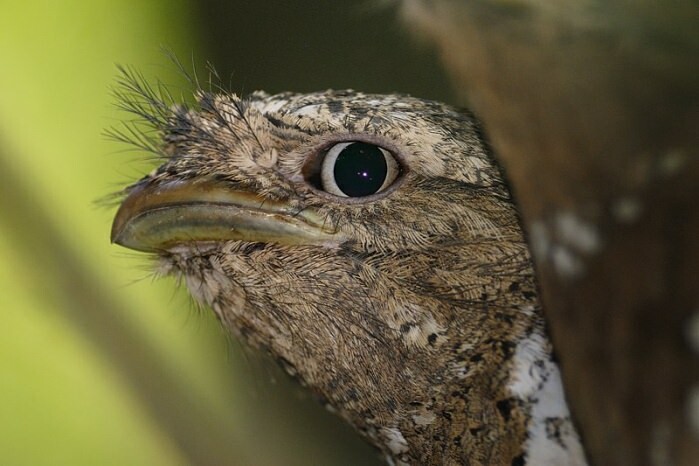 The Indian (or Sri Lankan) Frogmouth lives in India and Sri Lanka in the depths of the tropical forests. The bird is known for its ability to blend into its surroundings and has remarkable camouflage abilities. This kind of bird is called a ‘frogmouth’ because it has a very wide mouth and feeds on small insects, animals, and frogs. 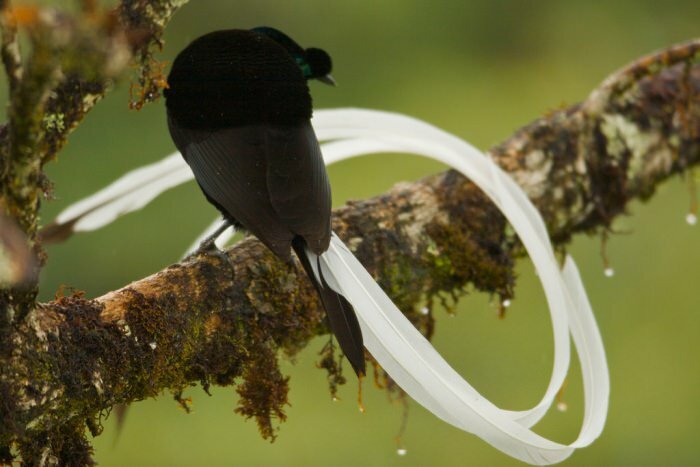 Sometimes called the black bird of paradise, the Ribbon-Tailed Astrapia’s existence was discovered in 1939 when researchers spotted its unusually thin and long tail feathers on the hat of an aborigine of New Guinea. The length of their tail feathers can reach up to 39 inches and are always white in males, posing a strong contrast to their velvet black bodies and olive green/turquoise frontal plumage. Because the species is hunted for its feathers, it is considered ‘near threatened’ by the nature specialists. 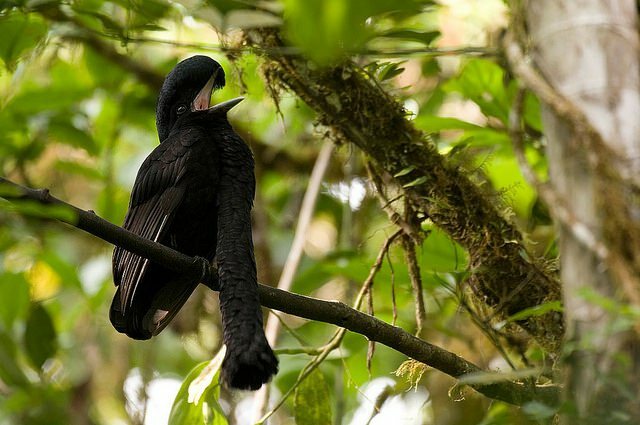 The Umbrellabird can be found in very limited areas of Western Columbia and Ecuador and reaches an impressive size of about 20 inches, making it easy prey for hunters. Males have an unusual 14-inch throat sack covered in feathers that resemble scales. During the mating period, the sack is inflated to attract females with a low cry that sounds similar to a growl and bleat. They are also considered a ‘vulnerable’ species by conservation specialists. 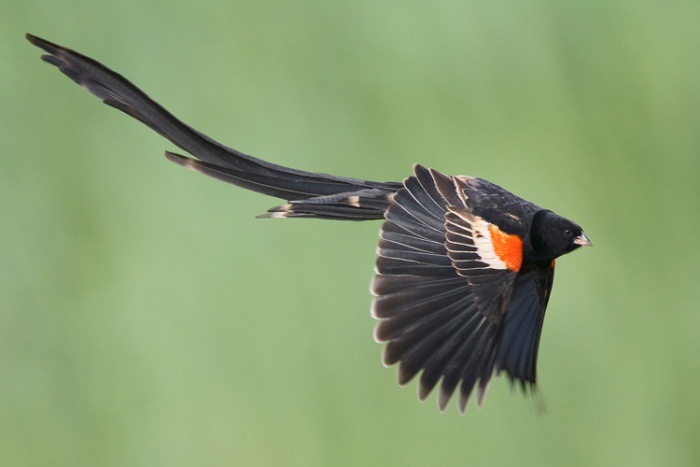 The Long-Tailed Widowbird is a common species in the savannahs and plains of South Africa. Males have a very long tail feathers that reach a length of about 20 inches (half a meter). During flight, they spread their plumage to attract females. The birds are polygamous, and on average there are about five females per family group. Common to southwest New Guinea and the Aru Islands of Indonesia, the Greater Bird of Paradise is an extraordinary bird that is also known as the ‘legless bird-of-paradise’. This is because, in the 18th and 19th centuries, their skin were set to Europe without legs, leading to the misconception that the birds were visitors from paradise that never touched the earth until their death. Fortunately, the bird is protected today and is ranked as ‘least concern’ by conservation agencies. This fabulous bird can only be found in southwest Asia, in Russia’s Far East during the summer and China and Japan in the winter. The bird is a fast, maneuverable flyer that takes off almost vertically. This kind of duck rarely dives, and usually these ducks perch on tree branches or relax on rocks. 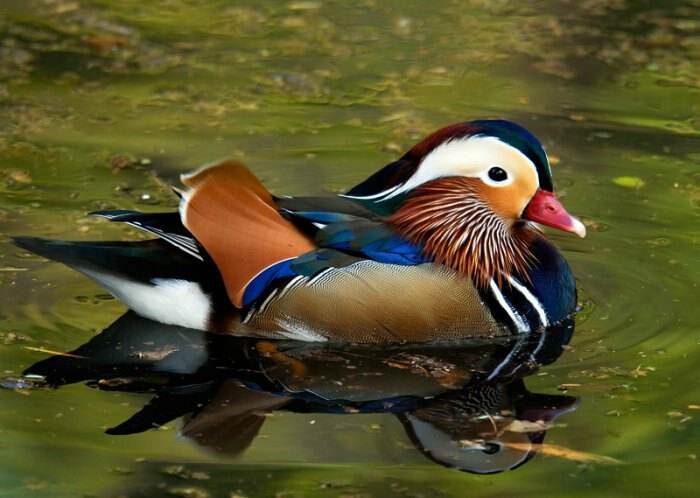 This special bird is highly respected and prized in Asia society.